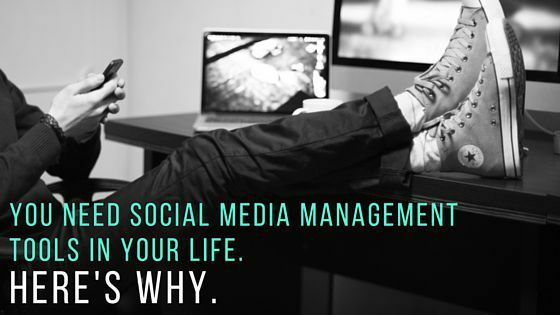 You need social media management tools in your life. Here’s why. The latest CMO Survey predicts social media spending will increase to nearly 21 percent of marketing budgets in the next five years, which is a huge increase from 5.6 percent in 2009. So what does this mean? It means companies are devoting more and more of their resources to social media marketing, and they’re not stopping anytime soon. Why? Because social media is essential for businesses — and it’s also too important for you to do without help. But good news: social media management tools can do some of the work for you. Here are five things they can help you with. It’s why you’re on social media in the first place, right? Engaging with followers is everything! Social management tools help you keep track of what people are saying about your business so you don’t miss out on important conversations and opportunities. Without having to keep track of these yourself, you can devote your time to building relationships. Checking multiple social platforms and pages is not only a pain but a huge waste of time. Social tools collect all of your content and put it in one place so you can do all of your managing from a single platform. Respond to people on all of your accounts with the click of a button. People often update their social media whenever they have time for it. But when you do that, you miss out on timing posts so that they see the most engagement. The right social media tool makes it easy to schedule posts ahead of time, keeping your posting frequency in check and freeing up some time! Keeping track of reviews of your business on social media is essential for maintaining your company’s reputation. Responding quickly to negative reviews and getting a pulse on customer satisfaction shapes your online image. One ignored comment can cause a lot of trouble, so let social tools help save your business from potential problems. It’s important to keep tabs on your biggest competitors on social media and social tools can do this for you. Seeing the positive and negative things people say about other companies in your industry can help you decide how your business can improve and how you can attract new customers. Helping small business owners with their online presence is what we do best. We have tools that can make managing your social media much easier, and we want to help! Call us at 844.207.9038 or email hello@mopro.com to get started.